The London Borough of Hackney, one of the inner London boroughs, has 62 parks, gardens and open spaces within its boundaries, totalling 330 ha. These provide the "green lungs" for leisure activities. Hackney Marshes contain the largest concentration of football pitches in Europe. In July 2008, seven Hackney parks won Green Flag awards for Clissold, Springfield, Haggerston and Shoreditch parks, together with London Fields, St John's churchyard and Hackney Downs. St John's was also awarded 'Heritage Green Status'. 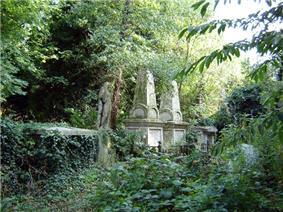 However, by contrast, Abney Park in Hackney was included in the Heritage at Risk Register in 2009 as one of Britain's historic parks and gardens at risk from neglect and decay. Hackney Marshes holds the world record for the highest number (88) of full-sized football pitches in one place. Stoke Newington Common – 2.15 hectares (5.3 acres). Victoria Park is an 88-hectare (220-acre) park, bordering on South Hackney, in the adjacent London Borough of Tower Hamlets. Well Street Common – 8.66 hectares (21.4 acres). Stoke Newington West reservoir, looking north. 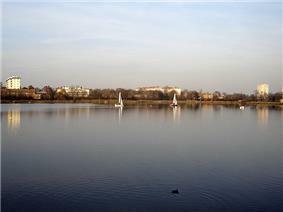 In the north of the Borough there are the two reservoirs (West and East) at Stoke Newington. The River Lee forms the eastern boundary of the borough. The towpath is suitable for walking and cyclists. It can be readily accessed from many places, and provides access to Hackney Marshes and the Lee Valley Park. The Regent's Canal and the man-made New River also pass through the borough. Towards the east, the Regent's Canal exits the borough into the London Borough of Tower Hamlets, it then meets the Hertford Union Canal, which forms the southern boundary of Victoria Park, running to join the River Lee Navigation at Old Ford lock. The Regent canal turns south, and meets the River Thames at Limehouse Basin. On the west, the Regents canal passes near Broadway Market, then into the London Borough of Islington eventually entering the Islington Tunnel, which is not accessible to pedestrians, or cyclists. ^ "Assets Document SINC [Site of Interest for Nature Conservation] spreadsheet" (PDF). Hackney Council. Hackney Council. n.d. Retrieved 29 September 2013. ^ "London Fields Management Plan 2010 - 2015 updated January 2013" (PDF). /www.hackney.gov.uk/. Hackney Council. 2013. p. 4. Retrieved 27 September 2013. ^ "Springfield Park Management Plan, 2011-2016, updated January 2013" (PDF). Hackney Council. January 2013. p. 4. Retrieved 1 October 2013. 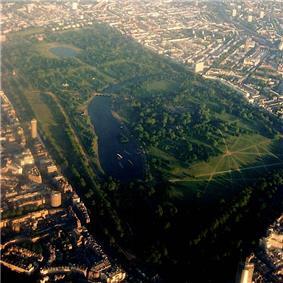 ^ "Common Land in England Stoke Newington Common". common-land.com. 2013. Retrieved 27 September 2013. ^ "Common Land in England Well Street Common". common-land.com. 2013. Retrieved 27 September 2013.